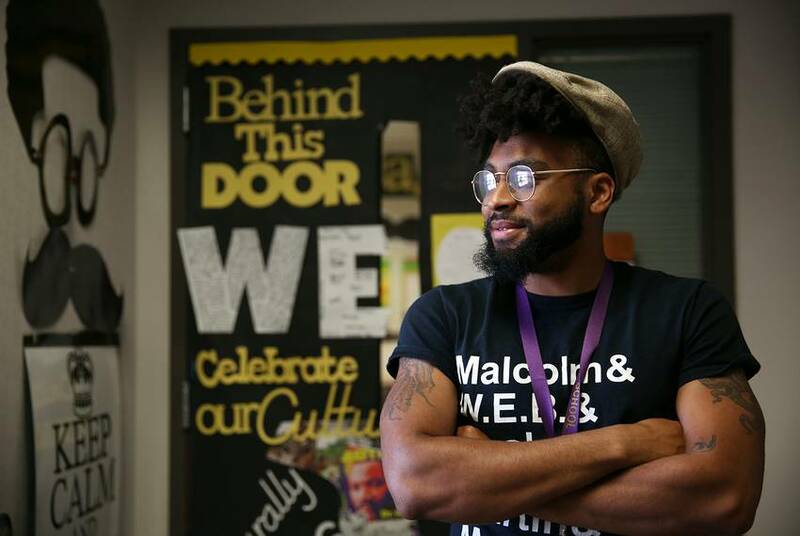 Homeless for a month and a half after the hurricane, Justin Williams had to put his life back together while teaching Alief ISD sixth graders. Tiffany Robinson pushed students even harder to pass state tests after teachers lost 11 school days to Harvey. HOUSTON — On a bright Thursday in April, in Alief Independent School District’s Mata Intermediate School, sixth-grade teacher Justin Williams walked to his classroom door from the hallway and crooked a finger, beckoning a gangly 13-year-old to come outside. A teacher had caught Mekhi Coleman goofing around with another student, the two playfully kicking each other when they were supposed to be quietly marching to their next class. “We were just joking around. We weren’t trying to hurt each other,” Mekhi said softly. “How can we fix it?” Williams asked, prompting Mekhi to think of an appropriate consequence. The 26-year-old social studies and language arts teacher was enjoying the chance to focus on his students again after months of upheaval following Hurricane Harvey. His students had become accustomed to seeing him duck into the hallway to argue loudly with federal disaster officials and car insurance agents after floodwaters swallowed most of his possessions. 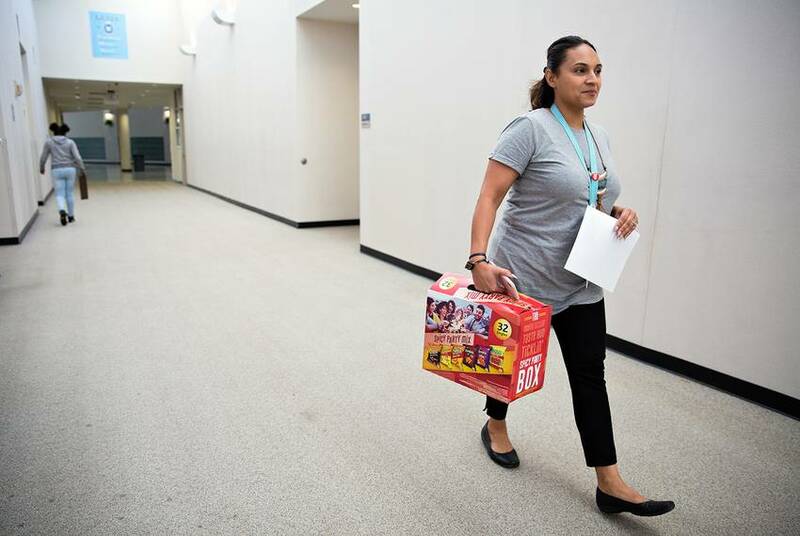 Later that same afternoon, two miles up southwest Houston’s Dairy Ashford Road, 35-year-old biology instructional specialist Tiffany Robinson lugged a 32-pack “party mix” of spicy chips out of her office in Alief ISD’s Elsik Ninth Grade Center, rushing to beat the 2:35 p.m. dismissal bell. She bustled down the hallway, on a mission to round up dozens of reluctant ninth-graders and convince them to give up a sunny afternoon to review basic concepts of biology in windowless classrooms. They had less than three weeks until the state-required biology exam they would have to pass to graduate, and Robinson knew her students — her “babies” — weren’t ready after losing 11 school days to Harvey’s floods. Responsible for helping the school’s biology teachers develop and adjust their lesson plans throughout the year, Robinson had a lofty personal goal: 95 percent of her students passing the test. And she wasn’t above bribing them with snacks. Robinson and Williams are among the many teachers across 60 Texas counties who spent this academic year struggling under pressure to keep their classrooms running after one of the worst natural disasters in Texas history. Meanwhile, as a challenging school year comes to a close, state education officials are preparing to make momentous decisions this month about how and whether to calculate state ratings for Harvey-affected schools, including Alief ISD’s, based on this year’s test scores. Alief ISD Superintendent HD Chambers has argued that the state should waive ratings for all schools in the disaster area, but Texas Education Commissioner Mike Morath has postponed a final decision until the summer, concerned that giving schools an early exemption from ratings would cause teachers to slack off. Chambers said his teachers continued to plan lessons while managing students’ anxiety-fueled outbursts and using vacation days to repair leaky roofs. As they awaited Morath’s final decision, they were preparing for tests that might not count. Williams had invited friends who lived in downtown Houston to camp out at his apartment the day Harvey hit in late August, sure they’d be fine in his second-floor unit in west Houston. But when city officials decided to release massive amounts of water from the fast-filling Addicks and Barker reservoirs north of his apartment, the water began climbing slowly up the landing until it was two stairs away from his apartment door. He tucked his pug, Sosa, under his arm and managed to find space on a boat piloted by the Cajun Navy, a grassroots group of rescuers from Louisiana. When he got to the shelter, Williams looked around at the families who had fled and felt a pang of sympathy. “I thought, ‘These people don’t have anything, and I do,’” he said. At Mata, Williams was known for keeping his students’ attention, even the troublemakers, by rewarding them when they focused and demanding they take responsibility for their disruptions. He had developed the habit of talking to his students like adults after starting his career at a Louisiana school working with students who had dropped out of traditional schools — some of them were as old as he was. He found that it worked with sixth-graders, too. Now, he dreaded seeing the looks of pity from teachers and students who knew he’d lost everything. “I was embarrassed to walk back in knowing I didn’t have anything and knowing that my colleagues knew,” he said. He didn’t want his students to think he was “weak.” So he told them, like adults, what they should expect. His colleagues wanted to help without making him uncomfortable. So Sims and other teachers began buying Williams new clothes and hanging them in his classroom when he wasn’t there. Someone left a $100 bill on his desk — with no note. Sims offered to do his laundry to help him save money. Williams was one of more than 1,400 teachers in Alief ISD — about 44 percent of the district's teachers — who reported being homeless after the hurricane and had to stay in motels or shelters or on friends' couches until they could find new housing or return to their homes. For a month and a half, Williams lived in a hotel, and his students whispered about seeing a burgundy sweater and pair of khaki pants over and over again. “We were all talking and one of them was like, ‘Why is Mr. Williams wearing the same clothes every week?’” said 11-year-old Jaidyn Roby. “And I just said, ‘Remember? He got hit by Harvey.’” A fellow teacher had taken Williams to a Marshalls store and bought him the sweater and pants using her credit card points. The students also heard Williams arguing at top volume with insurance agents in the hallway over replacing his flooded black Jeep. While the other teachers surreptitiously left their gifts, some of the students decided they could help, too. Isatu Kamara, 11, decided she would help relieve the pressure on her teacher by behaving in class. Despite the help, Williams realized he had fallen behind — school had started 11 days late, and he’d missed another week dealing with his hurricane losses — and he couldn’t cover all the reading and social studies standards the state expected him to teach that semester. 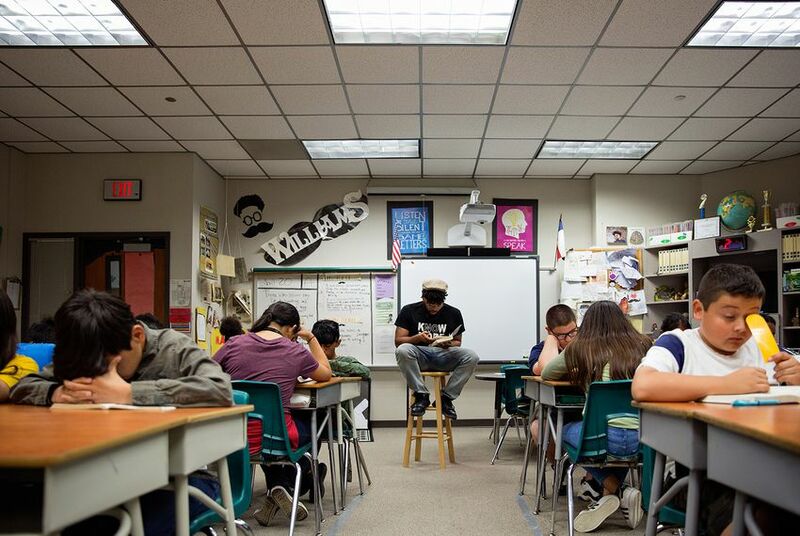 In the first nine weeks, he decided to prioritize teaching poetry in order to teach his students empathy and had them write about seeing their teachers “hurting” after Harvey. “We needed more time to talk about what we were thinking and what we were feeling,” he said. 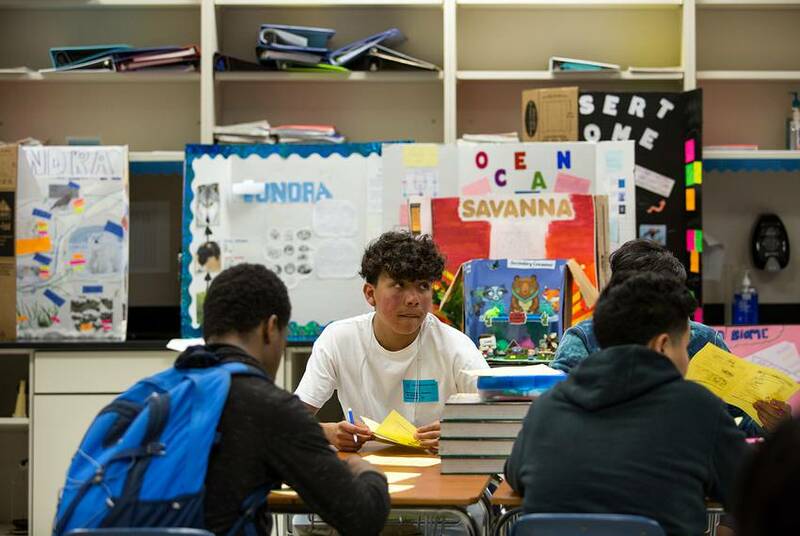 Soon after Harvey struck, Robinson and the team of nine biology teachers returned to the Elsik Ninth Grade Center a day before their students and quickly started to plan how to make up for the lost 11 days. They decided to focus their instruction for the year on the 16 crucial ninth-grade biology curriculum standards that Robinson calls the “sweet 16.” Those concepts, which the state requires students to know before leaving high school, were most likely to be on the May 8 state biology exam. The teachers also realized they would have to dump some material and cut short the time they spent reinforcing foundational concepts their ninth-graders should have learned in middle school. “Coming back, I felt a little rushed,” said Cortnee Williams, who teaches a biology class that includes students with special needs. 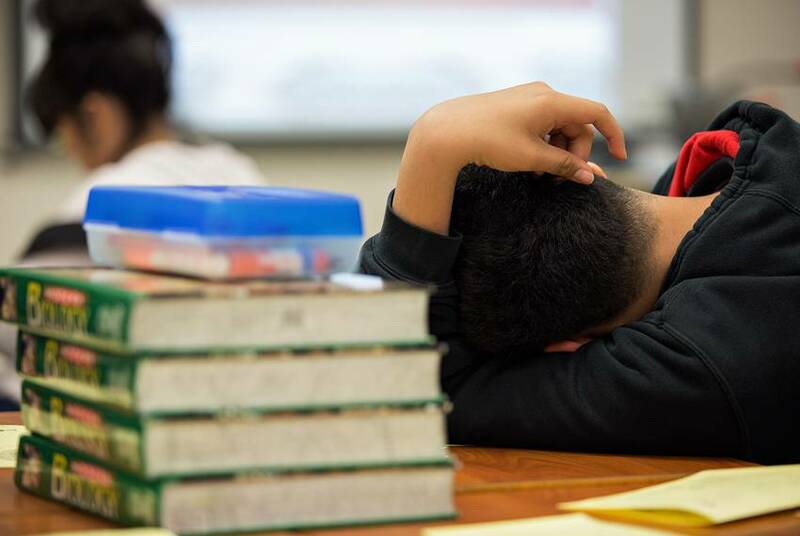 She noticed early in the year that her students were emotionally drained, fighting more often or not showing up for class. Academically, she said, they had a long way to go. Growing up in Germany as the child of a military dad, Robinson remembers being told by teachers and fellow students that she was “mentally retarded” or being treated as though she couldn’t learn because she was biracial. Now, she coaches her fellow teachers on how to adjust their teaching styles for students who need extra help. By April, Elsik’s biology teachers realized that their ninth-graders did not understand how to identify biological macromolecules — a concept that was almost definitely going to be on the May exam. So Robinson created a group that included a mix of students who had failed or barely passed the mini-assessment, and a few students who were doing well, and rounded them up for weekly, 90-minute afterschool tutorials for five weeks. During one tutorial, she watched with dismay as, despite the bribe of snacks, several students slipped out of her grip. The teenagers stood pressed around her in a small classroom, all swearing they had other commitments more urgent than learning how to identify a nucleic acid. “Miss, I can’t stay! I gotta go to work,” one teen in a white and black windbreaker told Robinson anxiously. “I thought we were going to do it on Tuesday.” After a quick phone call with his mom in Spanish, he hurried out. Robinson could only demand that those skipping out call their parents and explain they were leaving against her advice. Slouching in a white T-shirt, 14-year-old Daniel Saldaña said he needed to leave to re-take an English test, which could get him a higher final grade in the class. Besides, he said, he was doing fine in biology. “I’mma dip,” he said with a shrug. His feet betrayed him, shuffling near the door but not stepping out. Sensing she was about to lose one more, Robinson quickly called Daniel’s English teacher to negotiate: Maybe Daniel could stay for one of the two 45-minute biology review sessions and then go take his test afterward? After a couple of minutes, they came to an agreement. Robinson would get Daniel that afternoon, and then be responsible for pulling him from an elective to take his English test sometime the following week. His fate decided, Daniel grabbed a bag of FunYuns and relaxed into conversation with his friends. At the start of a new hurricane season, some of Alief ISD’s teachers were still living in damaged homes, without time during the school year to oversee needed repairs. In the fall, Williams moved into a new townhouse several miles from Mata Intermediate School. But he continues to receive calls from the energy company from his old apartment, warning him about an outstanding balance of more than $1,000. But his relationship with his students, he said, has changed for the better. They left him heartfelt cards and notes, he said, and began to see him as person more than just an authority figure. Every time he saw the gifts from students and fellow teachers, he broke down crying. “These people really cared,” he said. One day in the spring, 13-year-old Mekhi sat in Williams’ class and realized something had changed. Williams no longer seemed frantic or distracted and was not making phone calls while students were heading to recess or lunch. “I felt better that he wasn’t going through any more trouble,” Mekhi said. At Elsik, Robinson walked through the testing rooms on the day of the biology exam and watched the students, measuring their energy levels with her eyes. She saw more students than she expected hand their exams in after the first hour of a four-hour exam — not a promising sign. In the hallways, lines of students waited for the restroom monitor to let them into the bathroom, itching to leave their testing rooms. About 17 students didn’t show up for the exam at all, a relatively high number. “I’m hoping and praying that it’s okay,” she said. Weeks later, with almost a year gone by since Harvey made landfall, Robinson finally took a breath when she saw the results she had been working toward for months. Just 73 percent of Elsik High School students, including the ninth graders and older students re-taking the test to graduate, passed the biology exam — a slight decrease from last year. 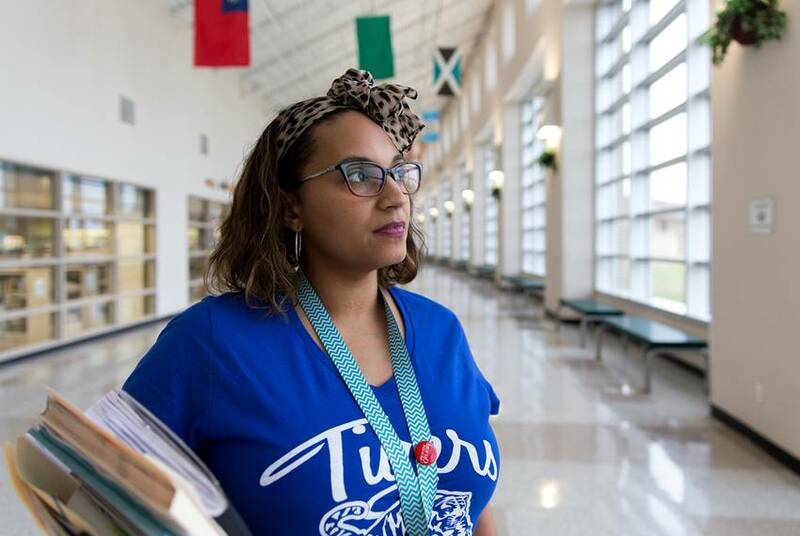 But her ninth-grade students — the ones she’d spent hours corralling to stay after school and take test after test — did much better, with 86 percent of them passing, a few points up from the year before. She didn't meet her goal of 95 percent, but she still felt a strong sense of relief.